I’ve had afternoon tea a few times (including for my hen do) at La Suite West a boutique hotel in Bayswater but I’ve never had dinner there. Their restaurant rebranded as Cafe Forty One this year and when I saw their Christmas menu I invited my Mum out to try it. We chose different options so we could mix and match, you could choose an appetizer or a starter so we went for both the appetizers. I never tasted fois gras when I ate meat so I can’t judge on that basis but it was tasty all the same. The carrot had a really fishy taste due to the seaweed which was really interesting. The cream cheese didn’t have a distinct flavour. Mum chose the polenta with mushrooms which was really tasty with the polenta having mustard kick. The filling for my nut Wellington had been creamed which was a bit different. The pastry was crisp but the mash was lumpy and would have appreciated some cooked veg rather than just salad leaves with it. We wanted the yule log for dessert but unfortunately they didn’t have any ready as lots of people had ordered them to collect to have on Christmas day. (They must have been good then!) Instead we had the other two desserts, baked Alaska and fondant. My fondant was rich which caramel sauce and a perfectly cooked pear. Mum’s Alaska was sweet and sharp with the fruit although it had a rock hard piece of sponge at the bottom. We gave our feedback to the waitress who said she would convey it to the kitchen and although it wasn’t perfect I think for £35 it was great value for money and I’ll be heading back there. The afternoon teas on the other diners’ tables looked delicious as well so I may have to get one for my birthday in Feb! Have you had dinner or afternoon tea at Cafe Forty One? What did you think? Let me know in the comments below. 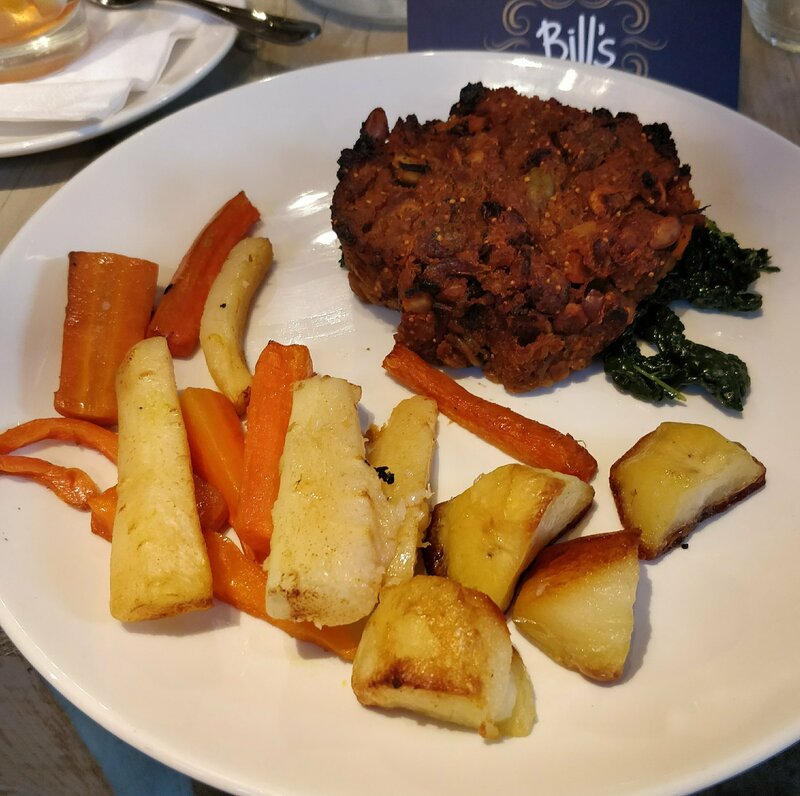 I had two days of Christmas company do’s in a row and after the abysmal display from Ipswich Town FC (basically just a plate of vegetables for both lunch and dinner) I knew things could only improve when we went to Bill’s in Shoreditch for our team Christmas meal. I had pre-ordered the 3 vegan options for starter, main and dessert, no choice but better than some years where you have to ring up in order to negotiate a vegan option. To drink I had a hot elderflower cordial. I’ve been suffering from a cold the past couple of weeks so this was really nice. 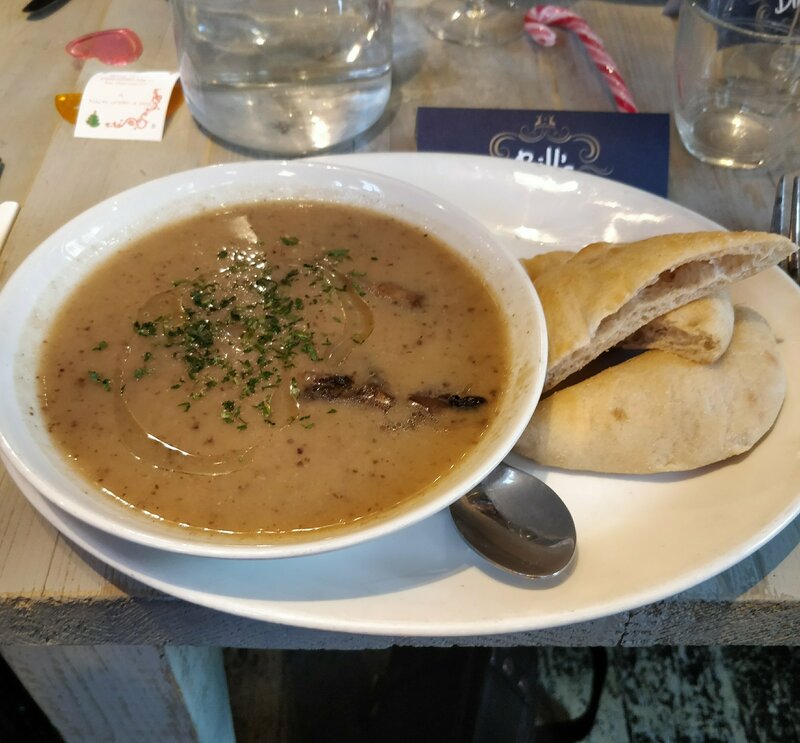 For my starter I had ordered mushroom soup, unfortunately mine and my colleague’s soup were both cold so they had to be sent back. Once they returned the soup was lovely tasting and the bread with it was great too. For main I had the vegan roast, again the vegetables weren’t incredibly warm. I enquired about a vegetarian gravy and the waitress took so long I was almost finished by the time she came back. The roast was really moist and flavourful though and I think a lot of effort has been put into that. 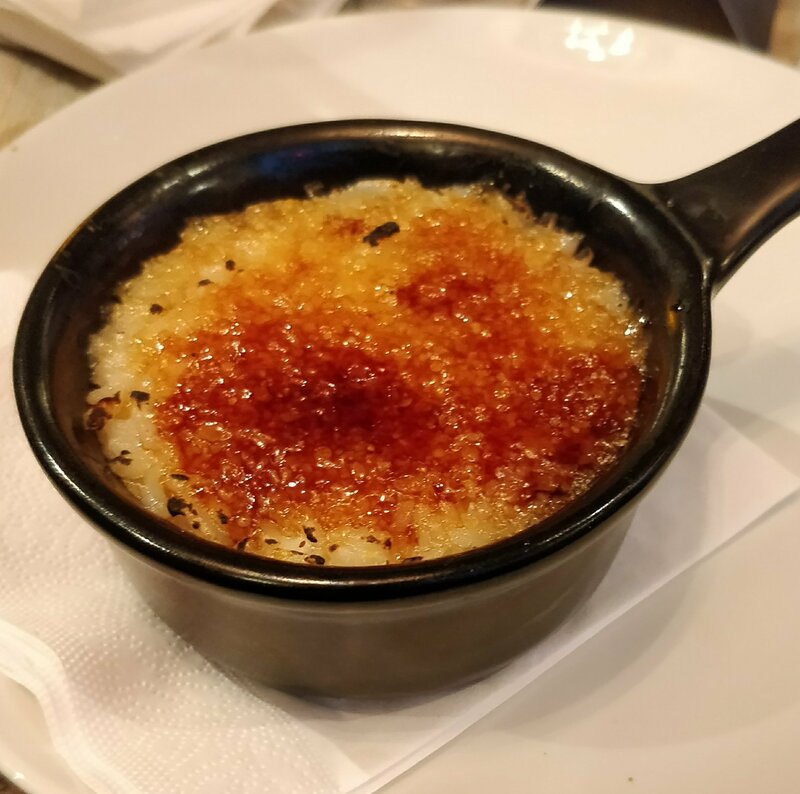 For dessert I had the rice pudding brulee. The sugar had a good crack but the rice was a bit claggy and didn’t have much sauce. Saying that I did manage to finish it. I think this dinner looked really nice on paper but was decidedly average on eating. I’ve never eaten in a Bill’s before and this just may be the pressure of the Christmas period and all the work meals going on. It’s not the worse Christmas meal I’ve had as a vegan but no where near the best. Have you been to Bill’s? What did you think? Let me know in the comments below. The Vegan Christmas Sandwich Battle! 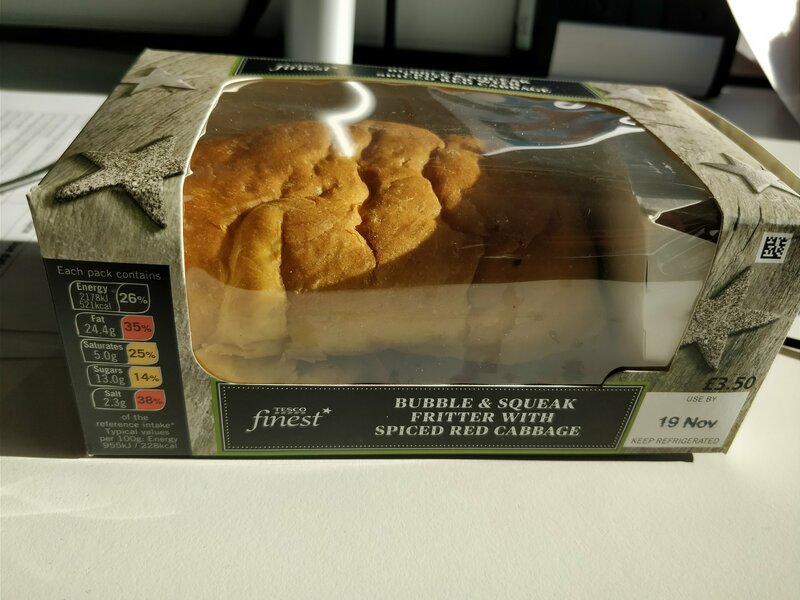 First up from Tesco we have bubble and squeak fritter with spiced cabbage in a carrot roll. I really enjoyed the cabbage but for me the fritter didn’t taste “fried” enough and the roll was too soft. I probably wouldn’t buy this one again. Next up is Leon’s vegan Christmas wrap, this had the added bonus of being warm. I really liked the crispy onions and the sage and onion mayo pulled it all together. It did seem a bit strange to use their sweet potato falafel in this wrap but with the cranberry sauce and everything else it had enough of a Christmas twist. I would definitely buy this again although it is a pricier option at over £4. Next up we have Pret. Stuffing, crispy onions, grilled carrots, spinach and cranberry sauce. This was really tasty and I would definitely buy this again and with a Pret opposite my office this is an easy lazy lunchtime option. 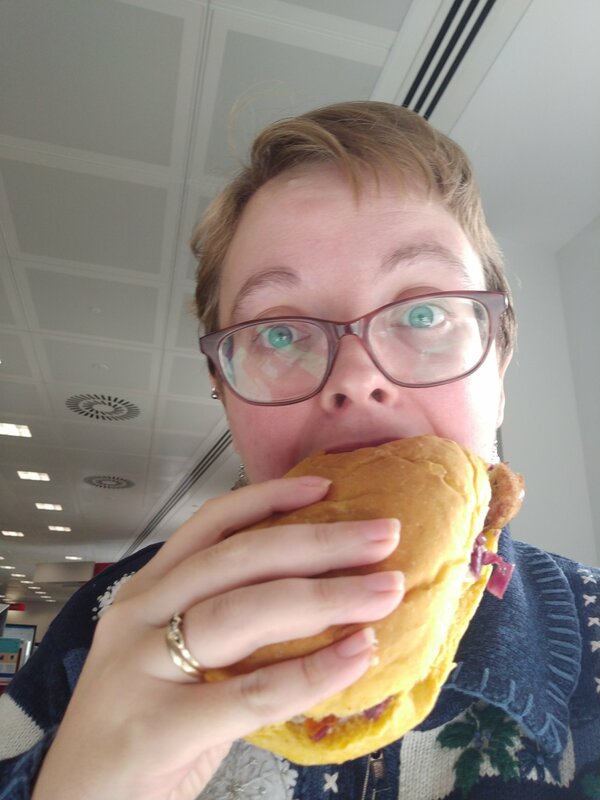 Now Boots, I was surprised I couldn’t find their vegan sandwich in the large branch in Liverpool Street station so I picked one up at the weekend from my local store. This one comes with parsnip fritter, butternut squash and vegan mayo. This had a good portion of filling but I didn’t feel like the butternut added much, saying that I would buy this sandwich again and getting it in the meal deal is great value as I also got some Hippeas and an Innocent protein smoothie for £3.39. I had high hopes for the offering from Mark’s and Spencer but I was sadly disappointed with this chestnut roast wrap. I was surprised it came in a red pepper tortilla (not very Christmassy) and it all tasted quite sweet with the grape and cranberry chutney. I did like the texture but I probably wouldn’t buy this one again. Eat’s sandwich seemed similar in description to other with stuffing, cranberry and butternut squash but this didn’t impress me and it goes in the “wouldn’t try again” file. Lastly we have a late contender from Crussh which my friend Mitsu informed me about. This is a mushroom roast with carrots. I feel this was lacking a cranberry sauce and another I wouldn’t try again. I tried to get Paul’s baguette but they didn’t have any when I went in this morning and I’m not back to the City until Tuesday, so I may update this post if I manage to snaffle one. So although there are a fair few offerings there are only a handful I would try again. Top spot goes to Pret and as this is the closest to my office I will be probably have a couple more before the festive season is out. A special mention also goes to Boots for the amazing value of their meal deal. What is your fave festive vegan sandwich? Let me know in the comments below. As vegans we don’t like to miss out and at Christmas especially! Although it’s only the beginning of November you might want to get started on your Christmas tin and space out your chocolate purchases. I first saw the idea of a chocolate tin on Floral Frosting’s Instagram account a couple of years ago and thought I’d give it a go. 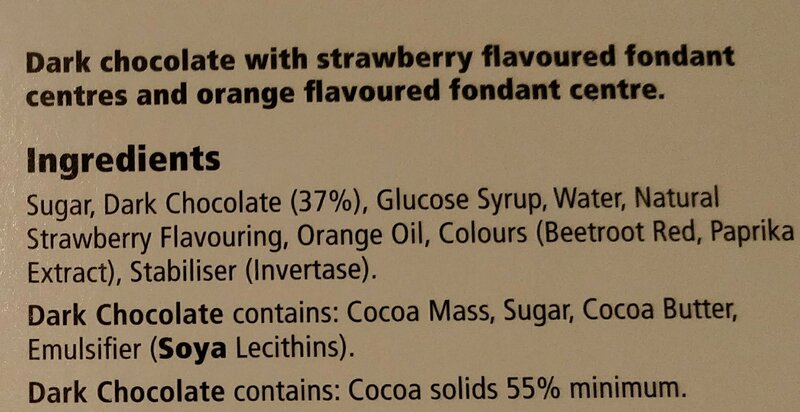 The aim is to get a mix of vegan chocolates so you can have a tin full of a variety of treats like those non-vegan Quality Street or Roses tin. So first off you need a tin. Most people have an old tin about which formerly had sweets or biscuits in. If your tin isn’t that inspiring feel free to decorate in any way you see fit. 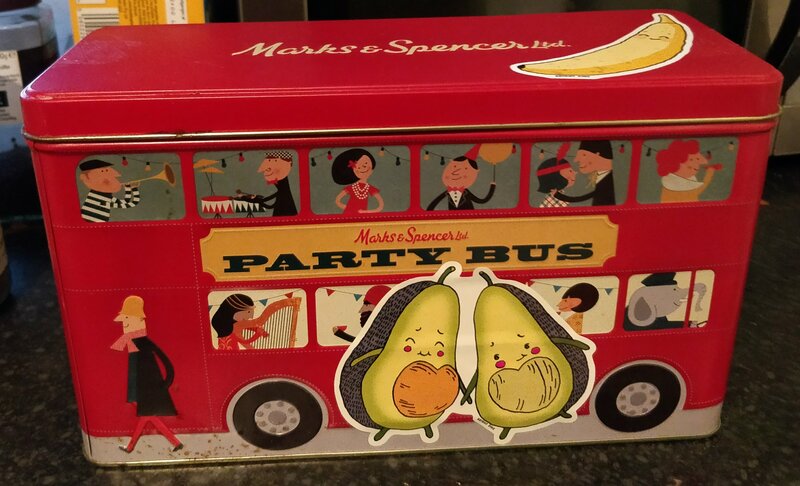 I had this lovely London bus shortbread tin which was given to me in my pre-vegan days and it has been hanging around on top of my kitchen cupboards ever since. I covered the “all butter shortbread” labels with some stickers I got from vegan zine – Brightzine recently. Now for the treats! I like to get things that are all individually wrapped but that’s up to you. Also by giving yourself a little bit of time you can hold out for special offers. First up we have Benedick’s mints, these are individually foiled wrapped discs with flecks of crunchy minty bits. I got these on special offer for £2.50 in Tesco. Another from Tesco is their fondant truffles (these are made by Choices so you might see them under that brand in other supermarkets). These are gold foil enrobed (that’s a good word isn’t it?!) caramel cups and remind me of the ones you can get in Quality Street. These were £2. Now a pound shop favourite – Jameson’s Ruffles, the raspberry ones are a firm favourite but this is the first year I’ve seen the peppermint ones. These are coconut based and covered in dark chocolate and at £1 a bag you’re onto a winner! I saw this ice cream flavoured glaciers in the pound shop too so although they were a little outside the remit of being chocolate based I thought I’d give them a go, my tin – my rules! 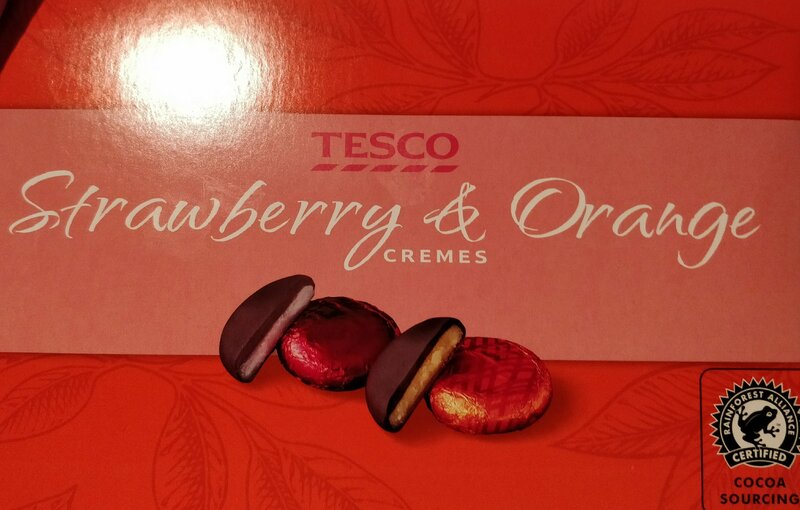 It was another trip to Tesco that saw me pick up these strawberry and orange cremes. I had seen them online but not in store on my previous visit so I tweeted Tesco to make sure they were in stock in my local store and what aisle they were in. I think their packaging has changed since I saw thetlm online which confused me. A box of these will set you back a pound so you can’t go wrong really. So that’s where I’m up to, I think that’s a pretty good mix but if I see something that just must go in I’ll add it. What are your faves that you wouldn’t have your tin without? Let me know in the comments below.